Bound to a rocket headed towards Washington, D.C., Nova and Nick Fury are only seconds away from death. Using all of his strength, Nova attempts a daring plan. Nova realizes his power of flight is a result of riding electron paths. By altering the electron path he is on, Nova is able to alter the rocket which is attached to him. The plan works and Nova controls the rocket into the Potomac River. Freeing his partner, Nova and Fury are at a safe distance when the rocket explodes. Later, Rich Rider is rushing to class when he runs into Roger "Caps" Cooper and Ginger Jaye. Ginger and Rich begin to argue and they agree to end their relationship. Rich leaves to visit his father, Charles Rider, who is in jail for robbery. Still angry, Rich begins to argue with his mother, Gloria Rider, and decides to move out of their house! On the waterfront, Rich begins to question why he's so angry lately. He is interrupted by Fury who tells him that life does get better. He also tells him the mission to stop Yellow Claw is far from over. At SHIELD headquarters, Fury introduces Nova to the ESP Control Chamber. SHIELD uses the device to study the mysteries of the mind. For their mission, Nova allows himself to be subjected to the ESPer. However, the machine's power setting has been set too high and Nova barely escapes a brain hemorrhage! Fury instructs his men to start at a lower setting. Elsewhere, Yellow Claw reveals to his captives, Dr. Sam Burley and Professor T'Kora, the details of his plan. Yellow Claw intends to unleash a massive tidal wave which will destroy New York City. Once the United States collapses, the rest of the world will follow and he will become its master. He also reveals to the men that they were the ones who unknowingly perfected his Tidal Wave Device. The captives deny their participation but find themselves again mind-controlled by Yellow Claw. In New York City's Chinatown, two men in trenchcoats enter a simple gift shop. After exchanging passwords, the shop owner opens a secret panel leading to the docks. The two men enter a watercraft which quickly takes them down to the Yellow Claw's headquarters! Entering the villain's lair, they are approached by two armed guards. The two throw off their coats to stand revealed as Nova and Nick Fury! Thanks to the ESPer, which placed information about the Yellow Claw's headquarters into their minds, the two heroes quickly rescue the captives. Nova rushes to stop Yellow Claw but is too late to stop him from activating the Tidal Wave Device! Instead of battling Yellow Claw, Nova decides he must stop the tidal wave first. He tries to smash the wave with his body but is quickly knocked back. Suddenly, Nick Fury and his men join the fight with special weaponry! Fury tells Nova they'll handle the wave while he finds Yellow Claw. 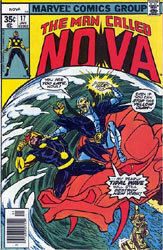 Nova rushes back to the master villain's headquarters and is attacked by Yellow Claw's illusions. The dragon he sees is actually a squad of the villain's divers coming to kill the Human Rocket. Nova is able to shake the Claw's influence and quickly defeats the divers. Smashing his way into the fortress, Nova and Yellow Claw face each other. Unknown to Nova, behind Yellow Claw's back is a psychogun capable of driving the hero insane!